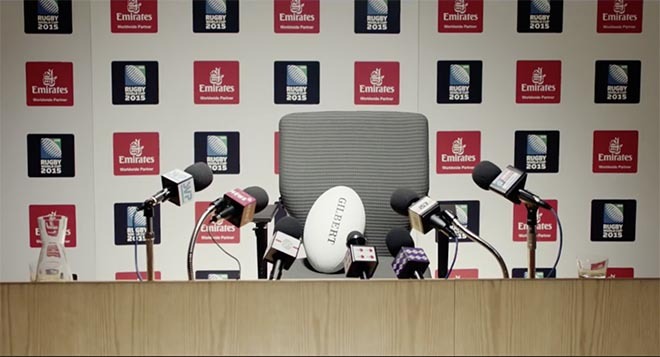 Emirates, one of the official sponsors of the 2015 Rugby World Cup, is running “Bringing Rugby Home”, an integrated advertising campaign centred on a fan photography contest. Rugby fans across the world are invited to submit photographs to the website emirates.com/BringingRugbyHome through Instagram, Twitter and Facebook, using the hashtag #BringingRugbyHome. The winner gains two airline tickets to Dubai. A 90 second commercial shows a Gilbert rugby ball’s first class travel from a sheep farm in New Zealand to Rugby World Cup game in the UK, including pampering by airline stewards and interviews in a press conference. The Emirates Bringing Rugby Home campaign was developed at RKCR/Y&R, London. Music is by Nick Foster at Soundtree.